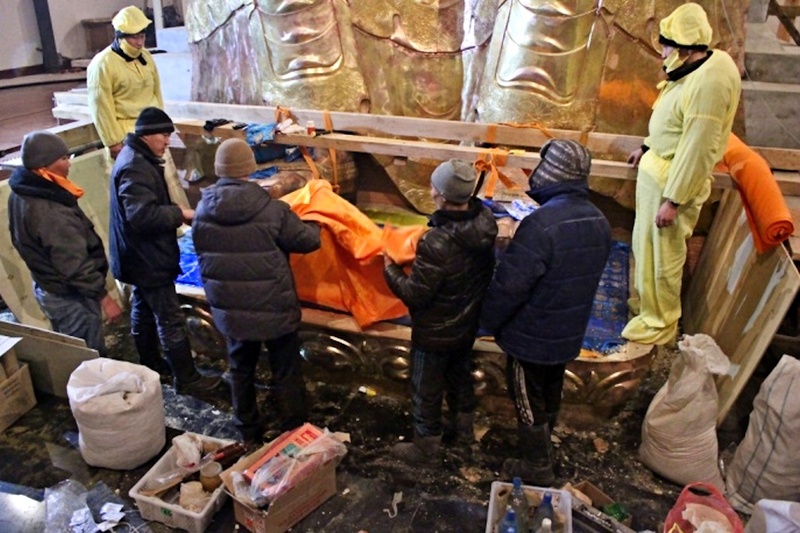 On Monday, Tatyana Zherebtsova, Deputy Minister of Culture of Zabaikalsky Krai, told TASS that restoration began of a statue 16-metres-(53-feet) in height of Maitreya (Mongolian Maidari)… a future incarnation of the Buddha. Craftsmen are restoring the sculpture, kept since 1940 at the Leningrad Museum of the History of Religion, with them making the missing elements. The entire project will cost 51.4 million Roubles (5.9 million Renminbi. 60 million INR. 946,000 USD. 1.1 million CAD. 1.17 million AUD. 774,000 Euros. 610,000 UK Pounds). She said, “The statue is in the Agin Datsan “Choyde Chenbo Decheng Lhundubling” (Abode of Spontaneous Realisation of Great Bliss) in Amitkhasha near Chita… the largest Buddhist monastery in modern Zabaikalsky. Federal Target Programme (FTsP) “Culture of Russia” (2012-18) funds the repair work, with a planned completion in 2015. This year, the plan allots 25.7 million Roubles (2.95 million Renminbi. 30 million INR. 473,000 USD. 550,000 CAD. 585,000 AUD 387,000 Euros. 305,000 UK Pounds). In 2015, we’ve budgeted the same amount”. 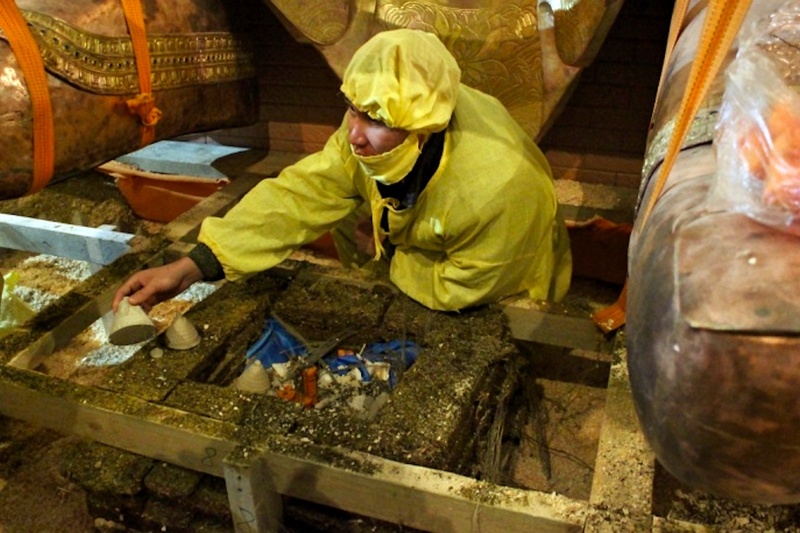 Sources at Agin Datsan clarified that, simultaneously with the restoration, Buddhist lamas would perform sacred rituals to animate the Buddha statues. They’ll place “Shun” inside the sculpture… sacred objects endowed, according to believers, with special spiritual power. As a rule, these objects include prayer-mantras, various grasses, herbs, juniper branches, and “Satsa”… small clay offerings in the form of stupa-suburgans. The monks pay particular attention to “Srogshin”… a cedar bar decorated with Buddhist prayers. As canonical texts state, without such blessings, the whole procedure is useless. The quadrangular pillar has a sacred significance, for the Tibetan word “Srogshin” means “tree of life” or “world tree”. Buddhists say that this particular Shun animates the statue. Bair Tsympilov, the rector of the datsan, said, “The Srogshin is ready. It’s made of Alkhanai Cedar; it’s about 16-metres-tall”. Agin Datsan bought the Maidari statue in 1889, Chinese masters made it. In 1940, the Leningrad Museum of the History of Religion acquired the statue. By the time that scholars arrived in the datsan, the figure was in a bad state, damaged, apparently, in a search for valuables stored inside. In the 1990s, the state returned the fragments of the unassembled sculpture to the Buddhist community, and in 2008, the Agin Datsan built a separate shrine for it. 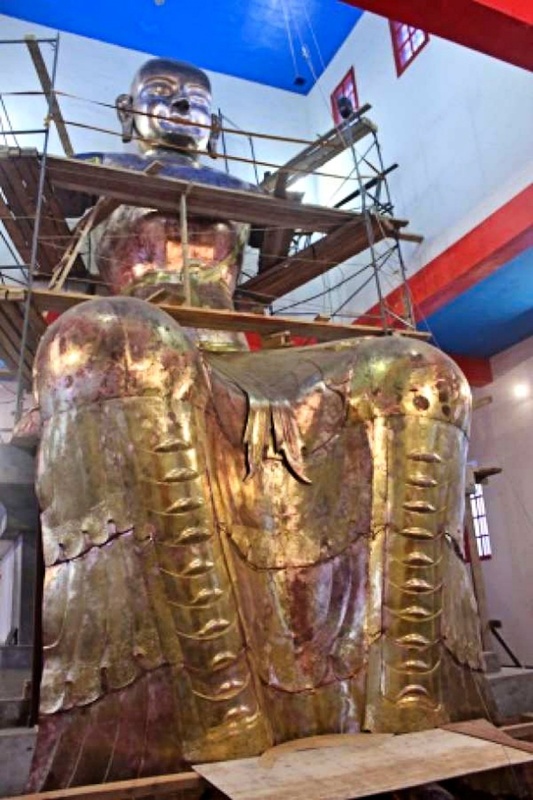 A source at the datsan said, “At the same time we built the shrine, we invited masters to engrave the surface of the statue, but a detailed study found that we only had about 15 percent of the fragments. As far as we can tell, most of the original statue is irretrievably lost”. All over the world, Buddhists revere Maitreya as the successor of Śākyamuni Buddha. The faithful believe that he would incarnate in a very difficult period for mankind and the light of his teachings would pull them out of the darkness of error and vile passions. In the sacred sutras, Maitreya Buddha’s advent would usher in a reign on earth of happiness and joy, life expectancy would reach 84,000 years, and the world would be under the rule of a Chakravartin… a Buddhist just ruler.